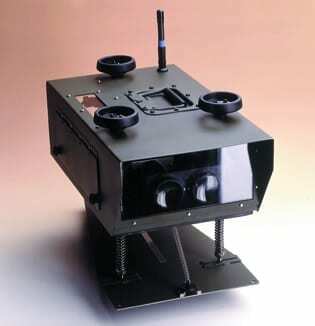 An NVG compatible battery powered portable precision approach path indicator designed for use during covert airfield operations. The 4 NVG PAPIs contained within MOSKIT are fully compatible with night vision goggles and emit infrared light as a split steady and occulting signal. An inbuilt inclinometer allows the chosen glide path angles to be set prior to the units being deployed in a wing bar on the port side of the runway approach. To ensure stability the portable PAPIs are mounted on individual base plates which are anchored to the ground. Once positioned on the base plates, spirit levels within the PAPIs allow the units to be easily levelled before use. 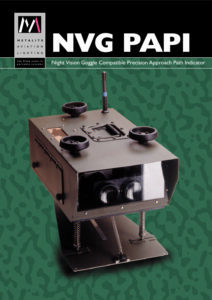 The NVG PAPI can be fully operated manually or by radio up to a distance of 4kms. A single 12V rechargeable battery contained within the portable PAPIs provides 8 hours continuous operation. The NVG PAPI is an integral component of the MOSKIT portable airfield lighting system and is used together with ORELs and UALs contained within the MOSKIT trailer to create a 1500m minimum operating strip.